One of the most enjoyable experiences I had whilst travelling Sri Lanka was hiking Small Adam’s Peak and visiting the Nine Arches Bridge in Ella. What most tourists don’t tell you is that visiting Sri Lanka can be a disappointing experience. Hiring a driver is the most practical way to get around but the more adventurous traveller will find this arrangement disempowering and might even feel a little ripped off by it. Your driver will want you to follow the itinerary they have set, which will involve a fair share of tourist buffets and dodgy jewellery stores. You may make suggestions about where to go to your driver but trust me, Sri Lankans are very convincing and you will end up doing what your driver says. However during our stopover in Ella we had a chance to get out of the car and exercise our legs against a magnificent backdrop. Make sure you finish your trip here with a cheap massage! 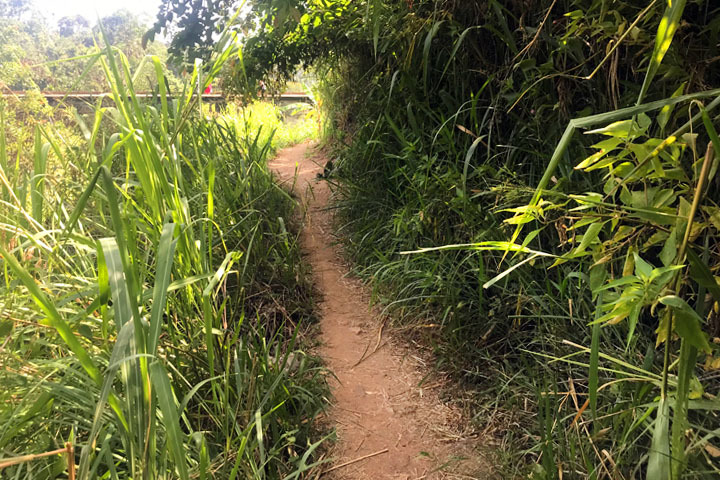 Whilst Ella is definitely a well trodden tourist trail, it was here that we truly got to immerse ourselves in the natural beauty of this green country. Ella is popular hiking territory due to its mountainous terrain and abundance of paddy fields and tea plantations. Most pilgrims head here to tackle the challenging Adam’s Peak hike. 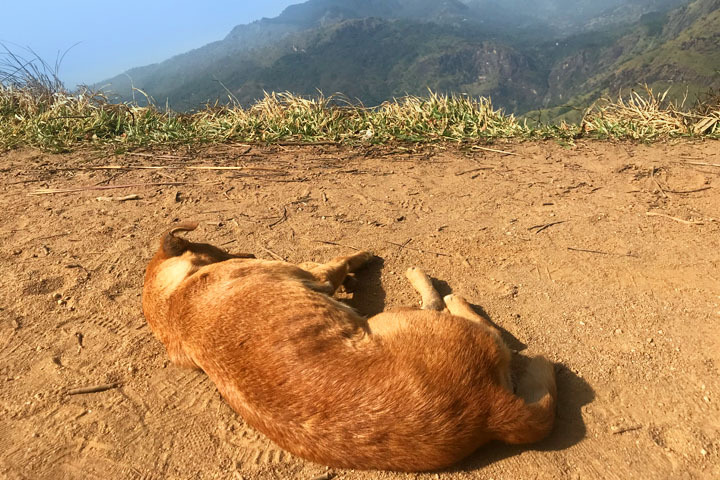 However if you want to enjoy the spectacular beauty of this region without hiking for hours, this scenic trail visiting Small Adam’s Peak and Nine Arches Bridge will take less than 3 hours. The walking trail starts at the Ella Flower Garden Resort, which is about 1.5km from the main road of Ella. You can walk this in less than 30 minutes but it won’t be pleasant as you will be walking alongside a main road with medium traffic and dust for the most part, so I recommend taking a tuk tuk. 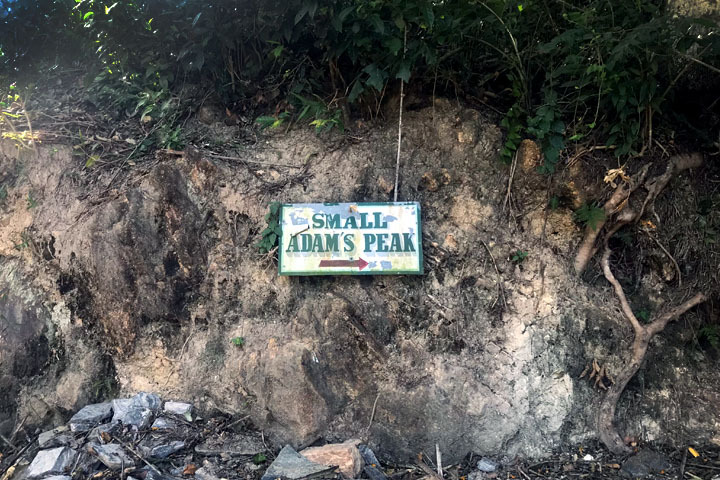 At the start of the trail you will see the following Small Adam’s Peak sign, which means you are on the right track. Small Adam’s Peak is named after a much larger mountain that looks similar and is called Adam’s Peak. The walk starts off relatively easy, with a slow incline that winds through the tea plantations and paddy fields. You may come across tea plantation workers during this part of the trail. Women are usually employed to pick the tea leaves because their hands are softer and less likely to damage the delicate leaves. If you take photos of them, give them a small tip as they earn very low salaries. During the early stages of the walk we came across an old uncle with several pet cobras. For a small tip, he played his magical flute and the cobras ose from their baskets and danced to the music. 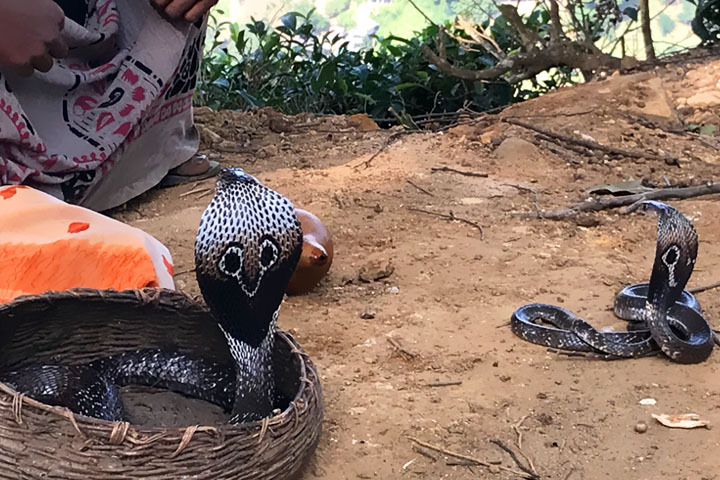 Cobras are a revered animal in Sri Lanka thanks to the famous Buddhist fable in which a cobra provided shelter to the Buddha against heavy rains whilst he meditated. About 15 minutes in, the walk increased in difficulty with a very steep set of stairs that continued steadily until the summit. The incline is what makes it challenging but fortunately the path is well paved and not too rocky so it is manageable for those not used to hiking or not wearing proper shoes. I felt my thighs were getting a good workout with all the steps, which was just as well after all the creamy curries I had been eating at the tourist buffets during the trip. When we reached the top of Small Adam’s Peak the view was breathtaking! Imagine panoramic views of rolling hills and a rich tapestry of greenery against vivid blue skies. We enjoyed just chilling out on the mountains edge soaking up the natural beauty. It would have been even better with a chilled bottle of wine and some cheeses and crackers. At the top of Small Adam’s Peak there is also a small shrine dedicated to Buddha and quite a few stray dogs. We are not sure how or why the dogs were there but someone was certainly feeding them as there were empty bags of dog biscuits floating around the mountain top. Many visitors hike Small Adam’s Peak to watch the sunset. 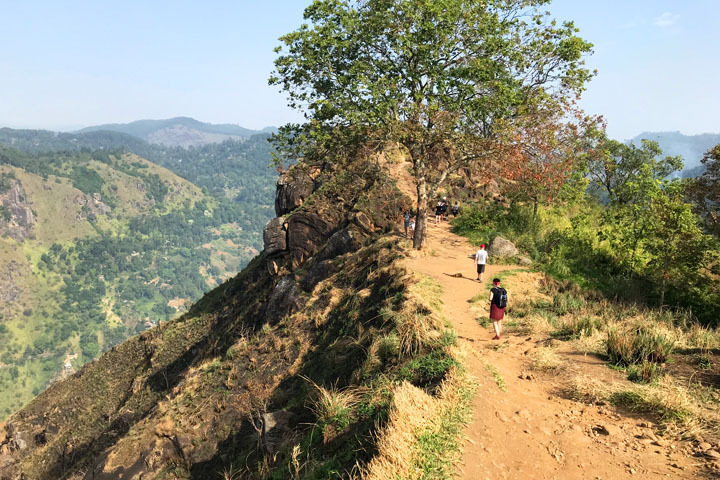 As the walk is relatively simple, if you are staying in Ella for an extended period you might find yourself tempted to do this great hike more than once. 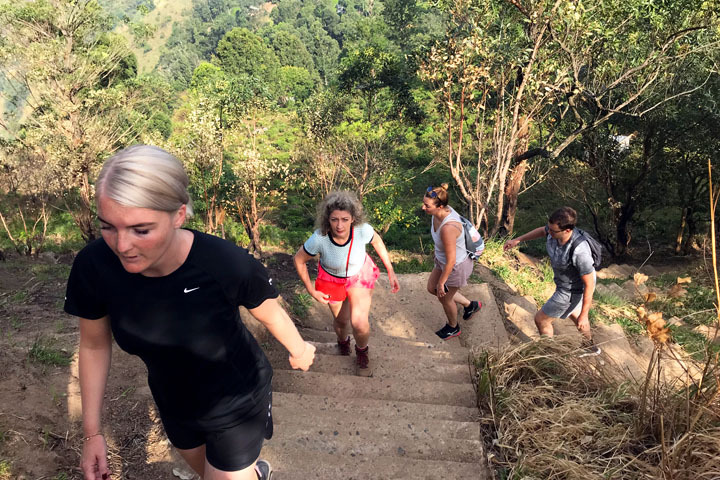 After completing the Small Adam’s Peak walk, continue along the main strip called Passara Road in the opposite direction from Ella centre and away from the Ella Flower Garden Resort. After a small measure veer left onto Nine Arches Bridge Road, which is narrow and involves a fairly steep walk downwards before crossing through a lot of greenery. However the walk is well paved and easy to navigate. After about 15-20 minutes of walking you will suddenly be surprised by a fantastic view of this picturesque bridge. Nothing can prepare you for this first encounter! Whilst the Nine Arches Bridge is certainly impressive in photographs it is much more astonishing in real life. The bridge is an architectural marvel standing at 80 foot tall with nine perfectly formed arches rising above lush green paddies. For this reason it is also known as the Bridge in the Sky. 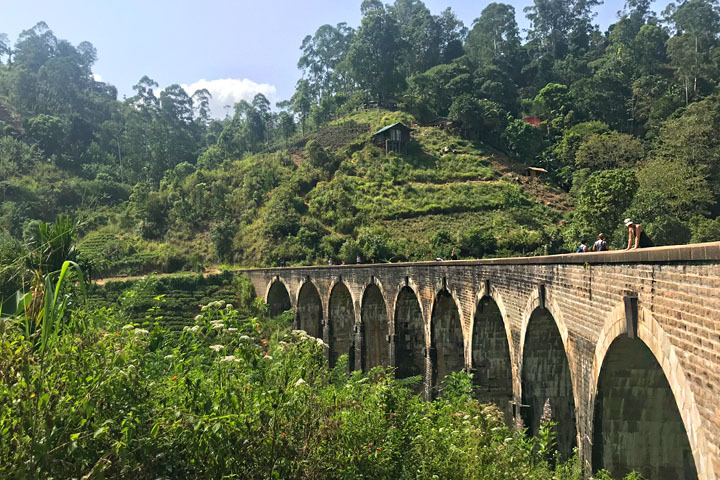 The bridge was initially constructed in the early 1900s by the British colonials to serve as a link in the rail network connecting Ella to other major cities in Sri Lanka such as Galle and Colombo. The railway is still functioning today and if you time your visit just right you might even witness a train crossing this picturesque scene. During the weekdays, the train normally passes around 11am in the morning but you can checkout the train timetable or ask your hotel for advice on timing your visit. The Nine Arches Bridge is one of the best examples of colonial-era railway construction and as a result it does attract a lot of local as well as foreign tourists. When trains are approaching security will guide people to safety and far away from the railway tracks. Otherwise between trains, most visitors like to pose with an iconic shot on the tracks such as I did although I was brutally scolded on social media for doing so by railway safety groups! By the time you have hiked Small Adam’s Peak and walked to the Nine Arches Bridge, your legs might be a little sore. A nice way to wrap up the adventure is to treat yourself to a cheap message in Ella. I started this blog by saying at times I felt ripped off by my driver. The entire time I was in Sri Lanka my driver kept harping on about the marvels Ayurvedic Spa. I had never heard of it before but my driver kept saying it was a special medicinal massage unique to Sri Lanka that involved special herbs which help you stay young. Naturally he tried to drop us off to a few of these so called Ayurvedic Spas who all wanted to charge us $100 for a one hour message!! We politely declined as we knew we could have cheaper massage in Singapore. However in Ella we enjoyed 24 hours of freedom from our driver and found there are lots of cheap message shops that brand themselves as Ayurvedic Spas. I recommend visiting the Hela Osu Suwapiyasa Ayurvedic Spa. The ladies here are pleasant and accommodating and it was great value for money! Ella is a major stop on the tourist trail in Sri Lanka and there are endless options for accommodation in the main part of town. However I would recommend staying away from the high street to enjoy more impressive views and warm hospitality. We stayed at the Nine Arches Lodge, which is a perfect location from which to access both the Small Adam’s Peak and Nine Arches Bridge walks. 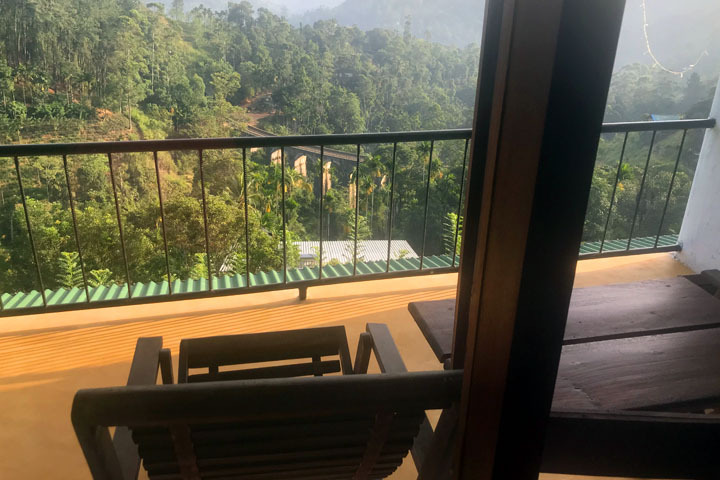 Located along Passara Road, we could see stunning views of the Nine Arches Bridge from our modern room and we were served a beautiful breakfast of fresh fruits and delicious local tea each morning. 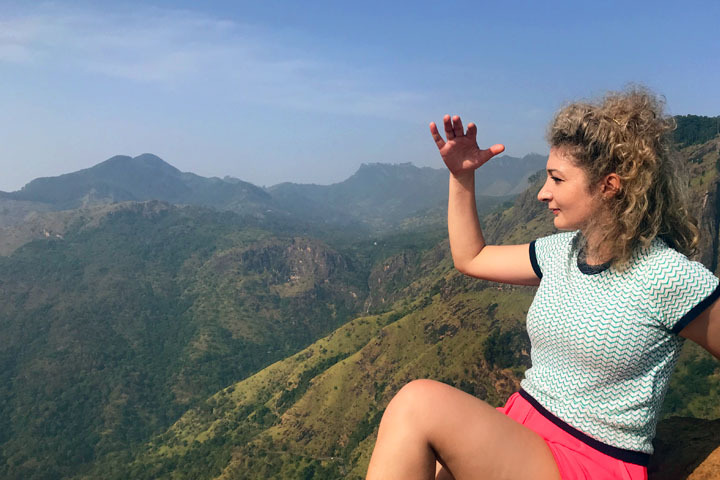 If you are going on a holiday to Sri Lanka I would recommend including at least a day in Ella as part of your itinerary. Although it is touristy it is also beautiful.